From the day he was born Reprieve was full of promise. He was the first foal from multiple group-winning mare Shania Dane, was perfectly put together and had a beautiful temperament. The colt began his racing career in Sydney but it soon became clear he wasn’t going to be the star everyone hoped for. He was transferred to the Canberra stables of Barbara Joseph and Paul Jones where he managed to notch just one win before having time called on his racing career. 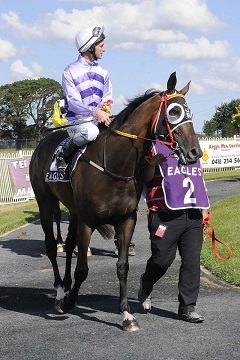 Reprieve parades before his race at Goulburn in 2013. Credit: Bradley Photos. Barbara Joseph has been training for more than 40 years and has a reputation for finding quality homes for her racehorses in retirement. She has a large network of contacts which she uses to ensure the right horse goes to the right new owner but she didn’t have to look far for Reprieve. Kylie brought Reprieve home and began re-educating him straight away. He took to jumping like a duck to water and earned a cheque in his first pre-novice one day event. Kylie then decided to give Reprieve a shot in the NSW Mounted Police but despite shining in most of his training he failed the final test and came home. This cloud had a silver lining though and the timing couldn’t have been better. Literally down the street a talented young equestrienne named Hannah Klep was left high and dry when her horse went lame. Her coach Fiona Gruen reached out to Kylie to see if she was willing to lend a horse to Hannah to allow her to keep training. Kylie agreed and offered Reprieve. 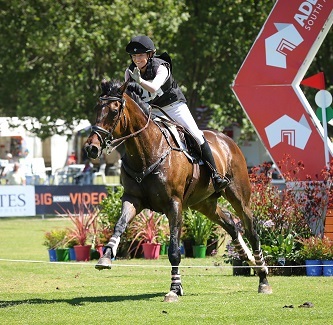 Hannah was just 14 at the time and had only been eventing since the age of 13. Reprieve was six and while that’s considered quite old for a racehorse, it’s young to be competing in equestrian sports. There were no problems though and the pair got off to a flying start. Hannah and Reprieve when they first teamed up in 2014. Hannah took Reprieve to Pony Club and continued regular lessons with him. They began competing at introductory level and completed 14 pre-novice events before qualifying for One Star. Because Hannah was under 18 she had to request permission from Eventing NSW to compete at One Star Level. Permission was granted, Reprieve was given a passport (necessary for any horse competing in Federation Of Equestrian International events) and off they went. Over the next 12 months they competed up and down the east coast of Australia and qualified for the Melbourne International Three Day Event at One Star level where they placed in the Junior category. 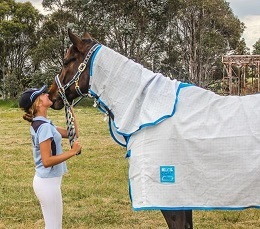 Hannah was then selected to represent NSW at the Interschools Australian Championships and was bestowed the honour of captaining the eventing team. “Representing the state was an amazing experience and I was very happy to finish fourth,” Hannah said. Hannah gives Reprieve a pat after they clear the final fence of the cross country course at the Australian International Three Day Event. Having excelled at One Star, Hannah and Reprieve were ready to step up to Two Star events which they have now been competing in for the past 12 months. Their biggest challenge to date came at the Australian International Three Day Event in Adelaide over the weekend. Now 19 years-old, Hannah was the youngest rider there and faced some of the country’s best eventers, including Olympians, in the competition. They managed to finish 15th out of more than 50 with Reprieve performing best in the Cross Country component. Reprieve will now be sent for a spell over Christmas while Hannah will continue working at Bimbadeen Park horse breaking, training and spelling facility. They will resume training together in the new year with the aim of competing at Three Star level in February.